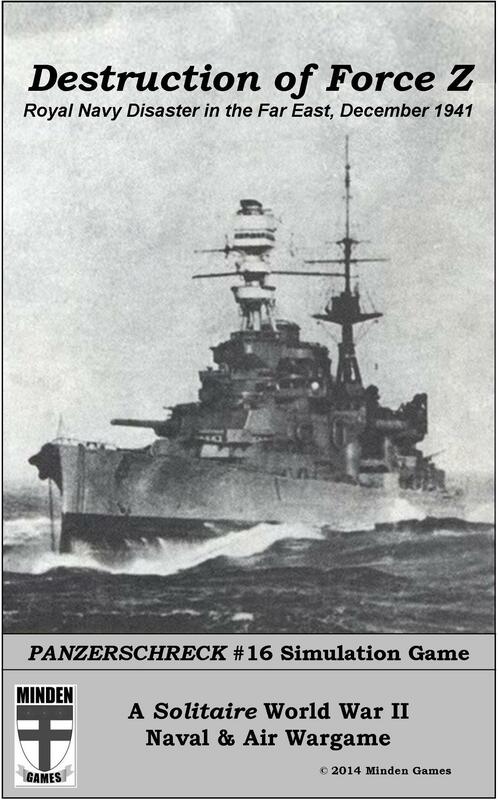 Panzerschreck #16 (Spring 2014) is now available as a free download. This 35-page edition includes articles, variants, and a Mini-Sim wargame (Salvo! 2nd ed.) within its pages. Feature reviews focus on Axis & Allies 1941 (Hasbro), Inchon (Simulations Canada), Oil War (SPI), and Ortona (Simulations Canada). Campaign Analysis deals with the backround and story of the Destruction of Force Z, in December 1941. Contains complete register of all past games published in Panzerschreck. Panzerschreck is back... this time, as a free downloadable magazine. Click on the icon below, and you can print off your own color copy of the magazine. Get your copy today! 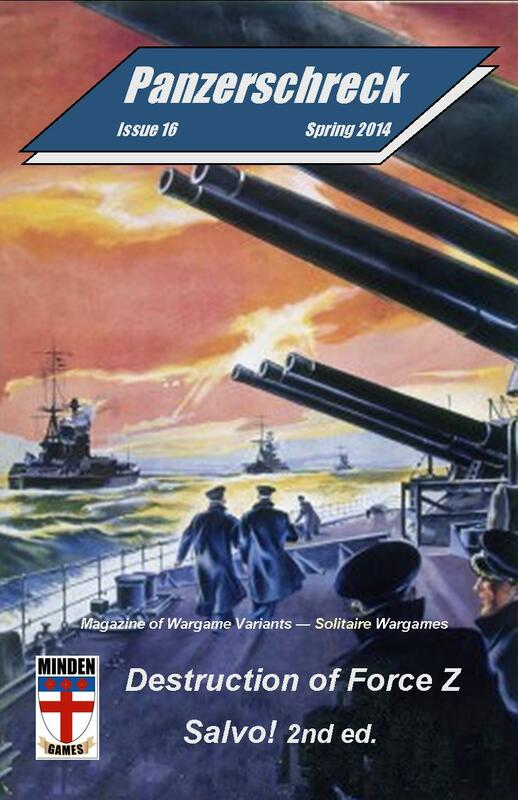 Description: This is a solitaire wargame that simulates the air and naval action off the coast of Malaya in December 1941, between Japanese forces and Force Z of the Royal Navy, based in Singapore. You (as the British) are faced with a difficult situation. Pearl Harbor has just been attacked. The entire Malayan peninsula is under treat of invasion. Your offensive options are few, but sailing and doing something to take the war to the enemy is better than doing nothing at all. Perhaps you can disrupt invasion sites? Intercept enemy warships? Whatever you decide, it will be an uphill battle. Do you sail with radio silence? Where should you sail? By what route? If your ships are found, they risk the wrath of land-based Japanese bombers in Indo-China, made all the worse as the RAF has warned they cannot guarantee protection of your ships. Destruction of Force Z is a highly playable game standing squarely within the Panzerschreck tradition. Counters (which must be cut apart prior to play) represent individual warships, and individual bombers and fighters. Besides regular rules, optional rules—including having the aircraft carrier Indomitable sailing with Force Z—provide you with everything you need to recreate the original campaign. The game casts you in the role of Admiral Sir Tom Phillips, commanding Force Z. Each turn you must check for weather, send (or not send) radio messages, move your ships, and deal with Japanese minefields, submarines, warships, and aircraft. The game system handles enemy movement. If your ships are sighted, they are subject to possible aerial attack from individual torpedo and level bombers. Anything can happen, but the odds are stacked against you. Can you win an improbable victory, and avoid the destruction of Force Z? 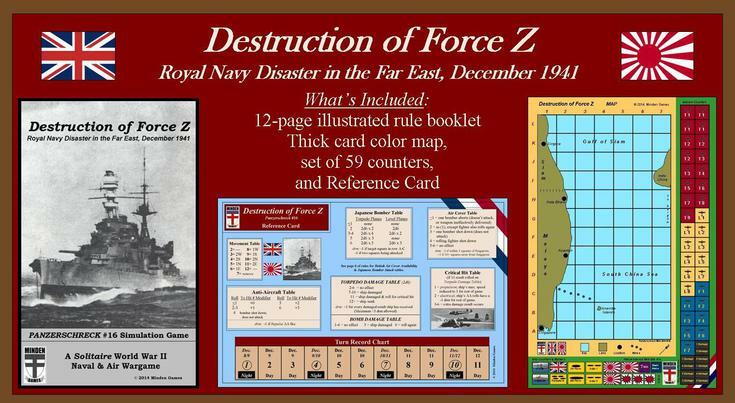 Click here for review of Destruction of Force Z on Boardgame Geek.